The first day of the World Business Forum was great. I am going to take a little time to process my thoughts and notes (see my Twitter feed for some of my initial thoughts). The barrage of speakers was a fire hose of information. I am very impressed at how many blog posts have already been written by some of the bloggers that are in attendance. Here is a shot of the Blogger’s Hub – we were in the 3rd mezzanine which is a great view. Since I coordinated the dinner, I did ask that everyone say hi on video. The light in the restaurant was dim, so the footage is a little dark. Comments are questions are always welcome and please consider subscribing to this blog. Between end of quarter activities and gearing up for both the World Business Forum and EMC Innovation Conference next month, my time for blogging has been a little tight. The World Business Forum website has a nice bio on each of the speakers, below are some additional resources to help you become familiar with the speakers and their subjects before the conference. Most of the speakers have books which I wish I had time to read, but blogs and videos will have to do. George Lucas: Beyond making some of my favorite films of all time (Star Wars series and Indiana Jones – did I mention that my dog’s name is Indiana? ), Lucas has transformed the film industry with his company LucasFilm. As noted in Wikipedia: Skywalker Sound and Industrial Light & Magic, the sound and visual effects subdivisions of Lucasfilm, respectively, have become among the most respected firms in their fields. Two weeks until the conference! Please share any additional resources that you have. I am also still looking for your questions for the speakers. We are less than a month away from the World Business Forum which is being held at Radio City Music Hall on October 6-7. HSM Americas has been announcing via Twitter the members of the Blogger’s Lounge. As we lead up to the conference, you can get to know the bloggers through their posts which I’ve aggregated on the World Business Forum FriendFeed group. During the conference, there will be a lot of Twitter activity. For the best experience, I would recommend that you follow a real-time stream of the hashtag, #WBF09; I will be using Tweet Grid, which you can see from this link. I will update the list as more information is available. [UPDATE: updated 9/29/09] I was very excited when I saw the list of speakers at the conference. Now I wish that there were two more days just to talk to all of the bloggers. We will all be looking to pull the outside world into this event, I hope you will join us and let us know of questions that you would like discussed. If you had the opportunity to ask one question to one of the speakers, what would it be? A former president, a noted columnist, “THE” CEO, the creator of Star Wars (and a major power in modern cinema, with ILM), and many more – see the list below and leave a comment including the speaker’s name and what you would ask. 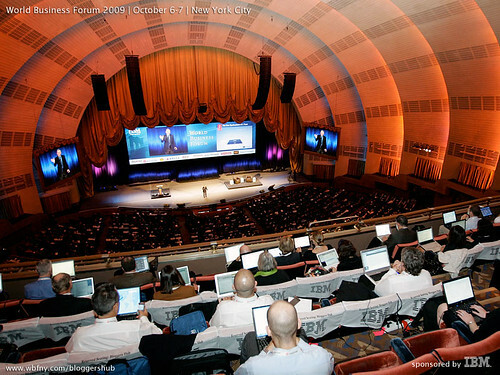 As a blogger, I’ll be looking to extend the conference beyond the 2 days and beyond the walls of Radio City. Looking forward to discussing online and in person; early registration runs until 7/31. 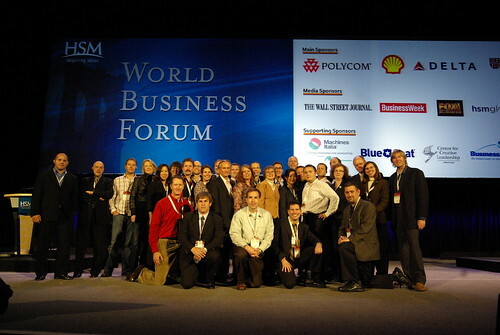 The hashtag on Twitter for the World Business Forum is #WBF09.